Although all “Cloverleaf” multi bay filters are sturdily constructed, the superb Genesis Mk 2 range is built like a battleship, and as a consequence can be placed in locations requiring backfilling. With the range being highly suitable for larger ponds special design large multi bay configurations are possible – subject to negotiation with the factory. 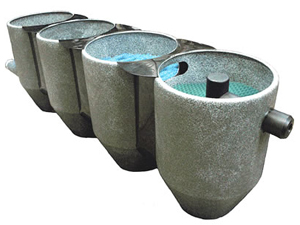 It is a great rarity to find a manufacturer who will construct a "one off" filtration system in accordance with a customers specific requests, but Cloverleaf will happily do precisely that. Illustrated here is the Genesis Mk 2 – 4 Bay system. 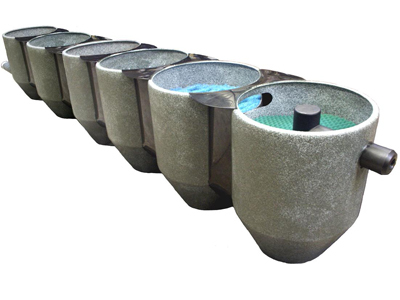 Size 2480 x 620 x 860mm high, with each bay nominally holding 50 gallons of water. This unit will cater for Koi ponds up to 4,000 gallons (18,000 litres). Concept of design is generally all as specified for the “CL” range and the above diagram. Bay 1 - Vortex. Bay 2 - Brushes. Bay 3 - Japanese Matting. Bay 4- Aquarock with multi layer foam protection. Size 3100 x 620 x 860mm high. 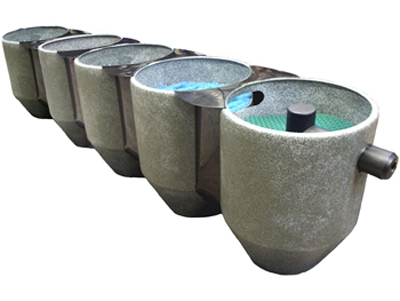 This unit will cater for Koi ponds up to 4,500 gallons (20,250 litres). Concept of design is generally all as specified for the “CL” range. This superb filter will also have a special appeal to those who feel constrained by the filtration mediums available in standard 4 bay units. Illustrated here is the Genesis Mk 2 – 6 Bay system. Size 2480 x 1860 x 620 x 860mm high. This unit will cater for Koi ponds up to 5,000 gallons (22,500 litres). Concept of design is generally all as specified for the “CL” range.